We look forward to partnering with you in 2019 to make it another successful year for TNR in South Washington County Maryland! Our goal: To improve the quality of life for Feral Outdoor Breeding Cats by spaying, neutering and vaccinating & providing medical care. Over 1,000 cats and kittens in Washington County have been through our Trap-Neuter-Return (TNR) program from 2010-2018. PurrHaven, Inc. is an IRS approved 501(c)3 charity run by a small team of volunteers. Our goal is to spay, neuter and vaccinate all outdoor breeding cats in South Washington County Maryland using a method known as Trap-Neuter-Return-Manage(TNRM). We target our efforts within certain areas in South Washington County where historically high rates of outdoor and feral cats are taken by the county funded pound. For 2019, our target area for TNR is Sharpsburg Maryland (21782). 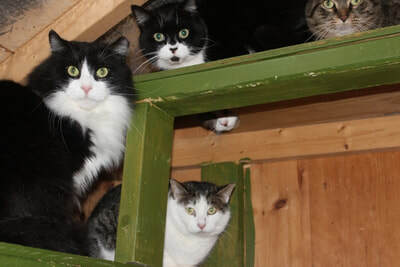 We continue to work with property owners to manage colonies of cats previously TNR'd in Rohrersville, Weaverton, Gapland, Keedysville, Clear Spring, Cascade, Smithburg, Sharpsburg and Hagerstown (21740). We are a No-Kill Charity. Our services are free of charge. If you feed outdoor breeding cats/feral cats in one of our target areas and need assistance, please go to our CONTACT PAGE, complete and submit the form. We do not receive any money from the state, county or federal government to provide our free spay neuter sponsorship services. All our funding comes from donations from the public and by applying for grants. We are thankful for the support from the following foundations and organizations in 2018: The Elizabeth Niemeyer Foundation, The Bissell Foundation and Metro Ferals. Shop for gifts, pet food, clothes, books, electronics or anything else you want - and help the many feral cats we help. Amazon donates 0.5% of the price of your eligible AmazonSmile purchases to PurrHaven, Inc. when you choose us as your charity. We only use donated funds for TNR, veterinary treatments, food and medicines. Since we are an all-volunteer team no monies are used for salaries. A Sharpsburg cat is happy to be returned to her home after being spayed.